- Sources with RG0 exposure levels are safe. The exposure levels of RG0-classified sources were calculated over long periods of time (more than 2.8 h). - Sources classified as RG1 do not pose a hazard when used normally. The basic concept for classification in the Exempt group is that the lamp poses no photobiological hazard. Any lamp that does not pose a retinal blue-light hazard (LB) within 10000 s (about 2.8 h) of exposure meets this requirement. The basic concept for classification in this group is that the lamp poses no photobiological hazard under normal behavioural limitations. Any lamp that exceeds the limits of the Exempt Group but does not pose a retinal blue-light hazard (LB) within 100 s of exposure meets this requirement. The basic concept for classification in Risk Group 2 (Moderate-Risk) is that the lamp does not pose a hazard due to aversion response to bright light or thermal discomfort. 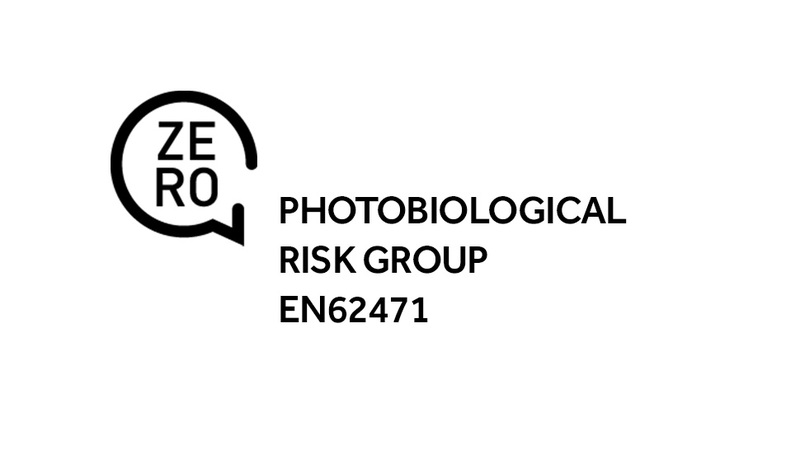 Any lamp that exceeds the limits of the Risk Group 1 (Low-Risk) but does not pose a retinal blue-light hazard (LB) within 0.25 s of exposure (aversion response) meets this requirement. The basic concept for classification in this group is that the lamp is hazardous even for momentary or brief exposure. Lamps which exceed the limits for Risk Group 2 (Moderate-Risk) are in Risk Group 3 (High-Risk).